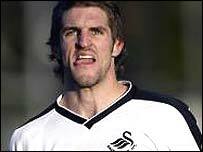 Swansea and Wales defender Sam Ricketts has committed himself to the club until 2008 after signing a two-year extension to his current contract. Ricketts, who joined the club last year, had a clause allowing for renegotiation if Swansea were promoted. "It has taken a bit longer to finalise everything because of the hectic move to the New Stadium," 23-year-old Ricketts told the club's website. "But I'm absolutely delighted to commit myself to a longer stay at Swansea." In 12 months, Ricketts has risen from non-league Telford to Swansea, the League Two team of the season, and Welsh international honours. He said he was glad all talk of a possible move can now be put behind him before the beginning of the new season. "This club is on the up - and I want to be part of it. I know there was talk about West Ham, but Swansea is now a big club in its own right. "There's a buzz about the place and as long as everyone wants to progress then I'm more than happy to be part of it. "I'm glad to say that all the talk in the squad is about promotion and not survival. While the ambition is here, so am I.